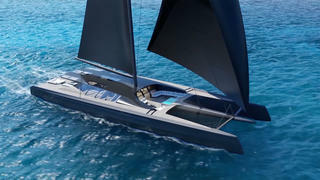 Finnish superyacht yard Baltic Yachts has been named as the official build partner of the 50 metre BlackCat catamaran project. Australian yachtsman Mitch Booth and multihull expert Malcolm McKeon created the BlackCat brand. The first model revealed is a 50 metre concept which would become the largest single-structure carbon-fibre yacht in the world if built. The efficient design means that the yacht will be capable of reaching speeds of up to 30 knots while the shallow draft will offer great flexibility for anchoring. 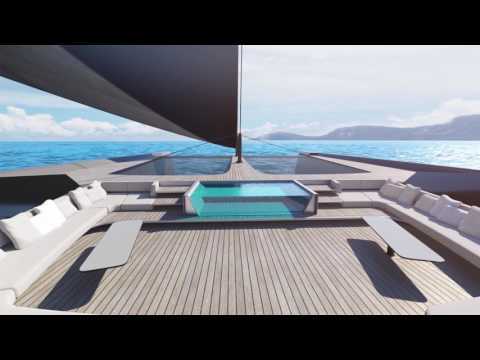 Former Olympian Booth, who has spent more than 40 years racing catamarans, said it was a “logical progression for superyacht designs to move towards catamarans”. “There are so many advantages to multihull superyachts compared to our monohull cousins, such as speed, space, low heel comfort, the list goes on and on,” Booth added. “This ‘super cat’ concept is really exciting because there is nothing else available that combines the practicality of an enormous, stable, platform, with exhilarating performance. The low levels of roll and pitch movement provide an extremely stable deck for comfortable nights at anchor. Due to its lightweight and low-drag design the BlackCat should also incur lower fuel and crew costs. Key features on board include a superyacht swimming pool, which is situated on the foredeck, adjacent to the owner's suite. 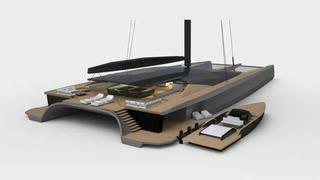 In addition to Baltic Yachts, other key partners signed up to the project include North Sails and Southern Spars, while M2Atelier Group would create the interior design.